Please forgive me for not writing sooner and for the haste in which I write now. Yesterday the last boys left and very soon the school will be closed, and I hope John will be out of the Navy. Just how long it will take to get his orders I don’t know. He hopes to have them soon after Christmas. When and if he gets out, we will go to the Univ. of Mo. to finish his P. H. D. or phd whichever it is, the very next move we make. [page 2] here now. Wells might to leave soon. We have been [tp] your old house just once since you left. The Weathralls have been very busy. Eleanor has been working in John’s office since Ruth left. Ruth is now head of the Red Cross in this District. Some stuff. Has a car furnished and everything. 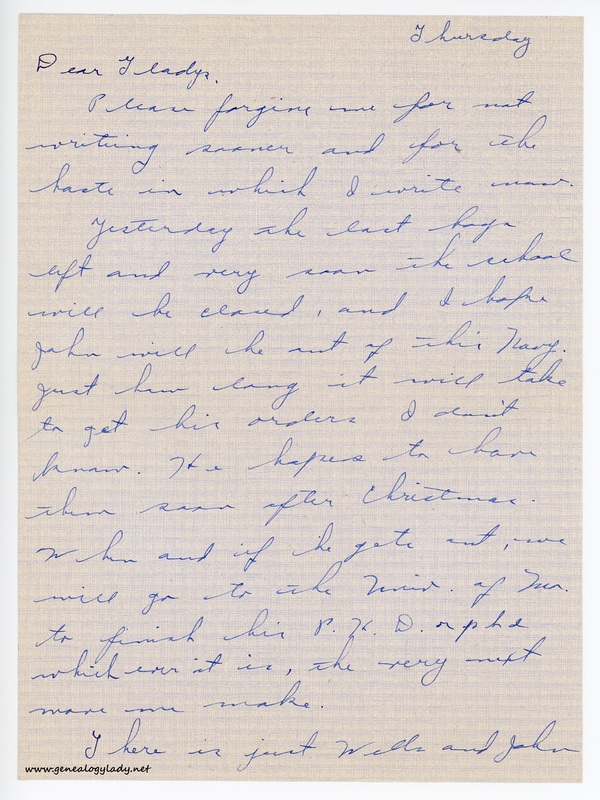 Please excuse this letter. I know there is a million mistakes but I’m in such a hurry. Poor little R.A. has such a bad cold and feels tough. John has one also and I have a little one. Please let me know right away how large you want your tablecloth. Maybe in the very near future I can finish it. It’s just about the same kind of a day that it was a year ago. R.A. is a year old. I know you must be very happy to be together in your own home again. Lots of luck and good wishes. 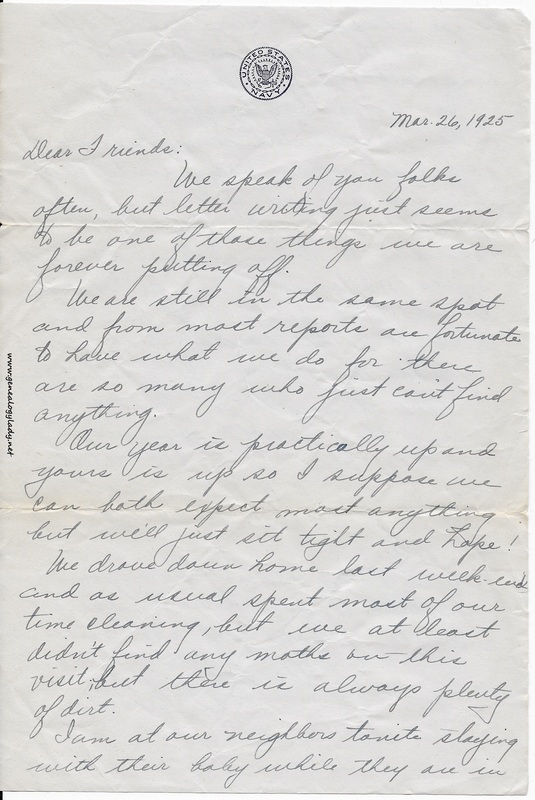 This is really terrible of me not to have written to you long ago, but really and truly I have been as busy with my own kid as you are with your three. Of course I know that doesn’t speak very well for my management, but then you know that ever was any good anyway. How have you all been? I certainly hope doing better than we have. We all have had terrible colds. R.A. the worst ones I ever saw a little one have. He has very large and bad tonsils and adenoids. I hate to think of going through what we have this last four months, until he is old enough to have them out. 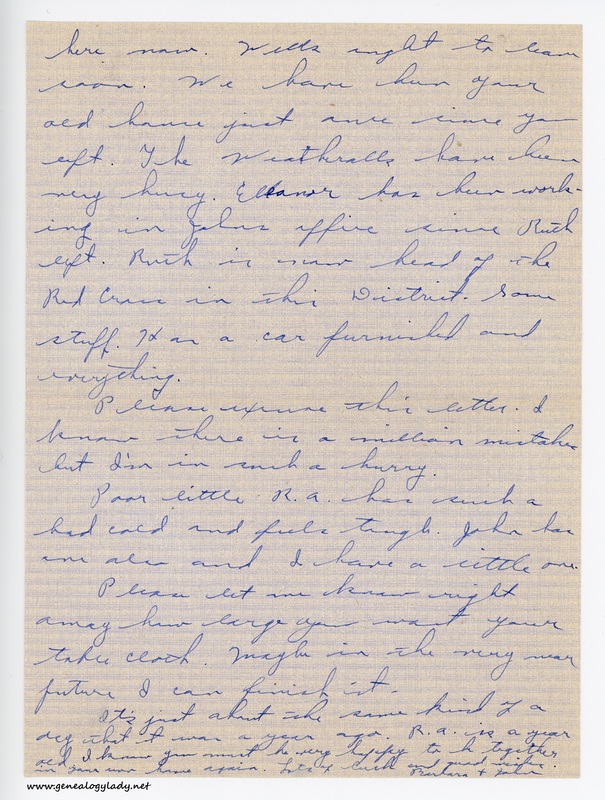 [page 4] I took R.A. and went to St. Louis to visit, the week before Easter and stayed till the Tuesday after Easter. Mother & Dad were there, staying at the Roosevelt Hotel, so they got me a room. We got the see most of our old friends, and I got to show them R.A. I’ve just been [?] to do that every since R.S. arrived. This was my last chance. The Folks were leaving for Minn. Soon and I knew that we would be leaving for parts unknown in the fall. My brother and his wife received their little girl not long ago, and she is a darling. 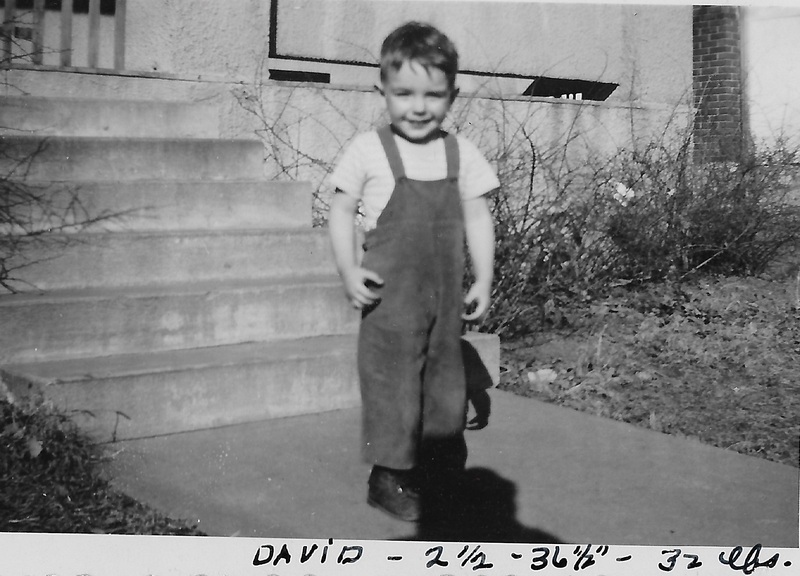 Two years old, blue eyes, blond hair, short and fat. Butch thinks she is wonderful and is now, very much, one of the family. [page 5] very happy about. 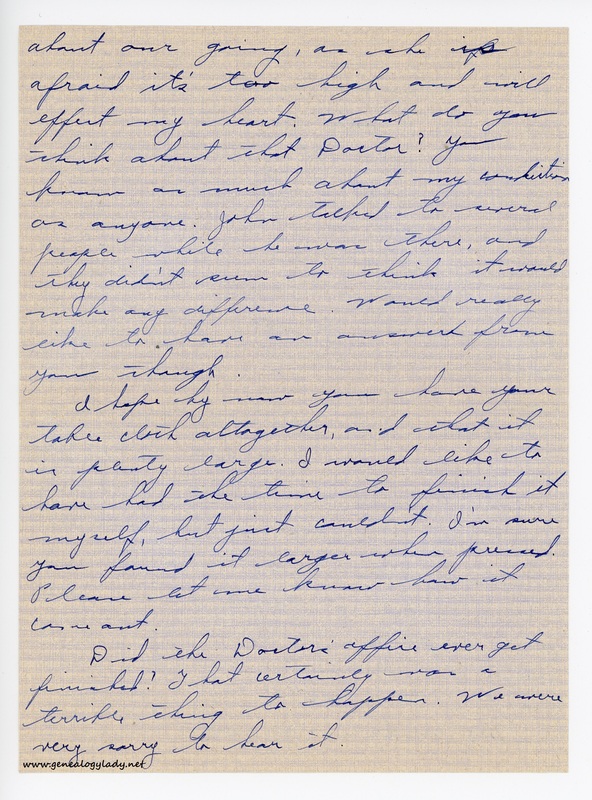 Last Thursday John got a telegram, asking him to come to Denver Colorado Univ. for an interview. He left and got back Sunday. There were to let him know as soon as the Dean had approved. Monday morning he got word that the job was his if he wanted it. So we are about to find ourselves on our way to Colo. in the fall. The whole set up is a nice one and we are very happy about it. Now our worry is finding a house. Our family is considerably larger than before and we will have to have a large place. Mother Moore is quite thrilled, as she has some friends and a sister not far from Denver. 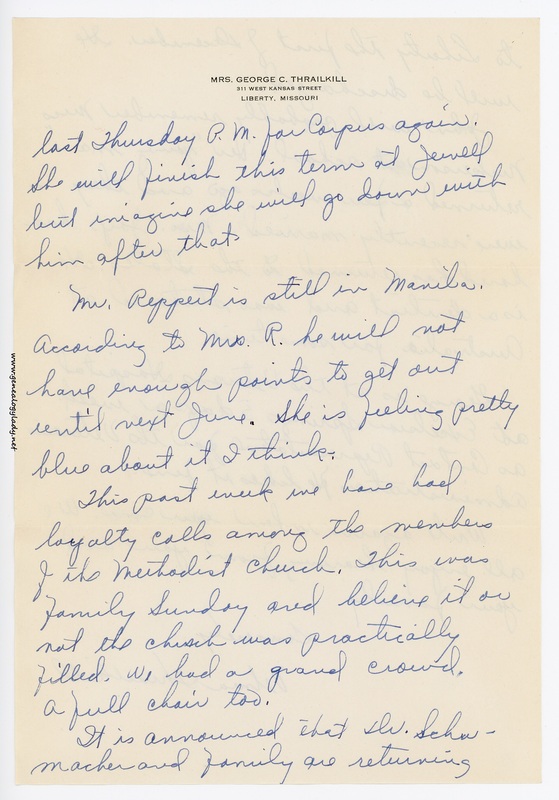 [page 6] about our going, as she is afraid it’s too high and will affect my heart. What do you think about that Doctor? You know as much about my condition as anyone. John talked to several people while he was there, and they didn’t seem to think it would make any difference. Would really like to have an answer from you though. I hope by now you have your tablecloth altogether and that it is plenty large. I would like to have had the time to finish it myself, but just couldn’t. I’m sure you found it larger when pressed. Please let me know how it came out. Did the Doctor’s office ever get finished? That certainly was a terrible thing to happen. We were very sorry to hear it. [page 7] Mother M. and I have been sewing like mad. I had to have several house dresses. R.A. had to have overalls. Mother M. had to have house dresses, afternoon dresses and slips. While I was in St. Louis, I got one new dress, material for a housecoat pink and while material for slips and Aunt Min. had just made herself a [?] formal, and didn’t like it, so she sold it to me for the price of the material. When I got it home I didn’t like the neck or the sleeves, so made it over. It sure was a job, but I think it’s very pretty now. Did you hear that Eleanor is expecting? I never was so surprised. They are in K.C. now. He has a mine job. Eleanor’s brother was here to see us not long ago. He will be here in school next fall. [page 8] This is just about all the news I know for now. Hope you are all well and happy. Please write soon. Our best wishes to all of you from all of us. 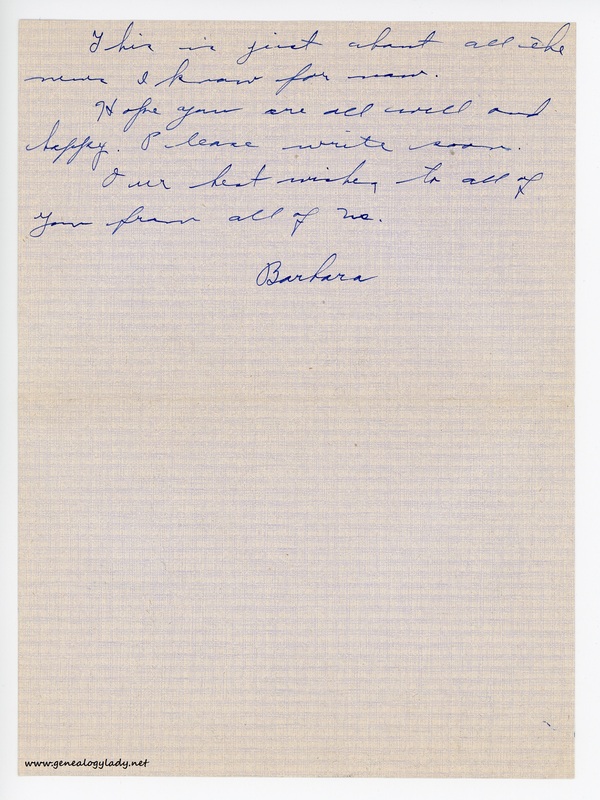 This entry was posted in Foster, Genealogy, Yegerlehner and tagged Barbara A. 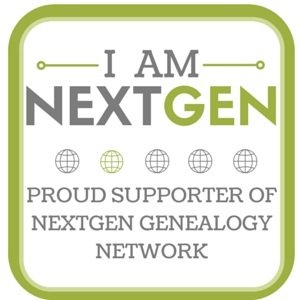 (Mothersill) Moore, Beulah (Jeffries) Moore, Columbia, genealogy, Gladys R. (Foster) Yegerlehner, Indiana, John B. Moore, Kentland, Missouri, R.A. Moore, Roscoe S. Yegerlehner on July 31, 2016 by Deborah Sweeney. It is almost Thanksgiving again and Christmas will be here before we know it. [page 2] a list in the paper every week of the ones discharged and it grows fast. Sherrill is doing well in school. She is taking Latin and Algebra and seems to like both. She still misses your family a lot. The Russell youngsters are back in school at K.U. 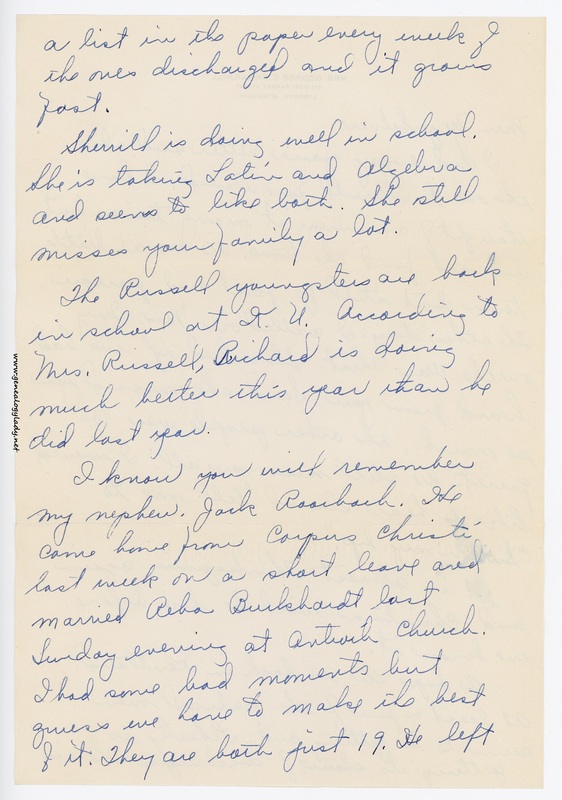 According to Mrs. Russell, Richard is doing much better this year than he did last year. [page 3] last Thursday p.m. for Corpus again. She will finish this term at Jewell but imagine she will go down with him after that. Mr. Reppert is still in Manila. According to Mrs. R. he will not have enough points to get out until next June. She is feeling pretty blue about it, I think. This past week we have had loyalty calls among the members of the Methodist church. This was family Sunday and believe it or not the church was practically filled. We had a grand crowd. A full chair too. [page 4] to Liberty the first of December. He will be discharged. John will probably remember Miss Nickerson at school. Her “young man” returned a few weeks ago and they were recently married. Mrs. Joy’s husband has returned to the States. He is a dentist and was stationed at Australia for some time. George is at the Veteran’s Hospital at Excelsior Springs 5 days a week as Contact Representative for the Veteran’s Administration. He likes it fine. Write again when you can. We all enjoy hearing from you and your family. 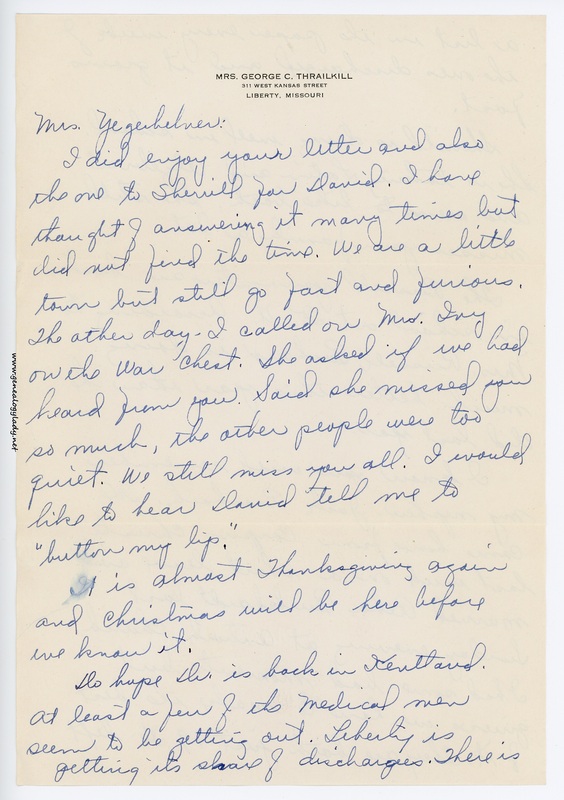 This entry was posted in Foster, Genealogy, World War II, World War II Letters, Yegerlehner and tagged David A. Yegerlehner, Dr. Schumacher, genealogy, George Thrailkill, Gladys R. (Foster) Yegerlehner, John F. Yegerlehner, Liberty, Missouri, Roscoe S. Yegerlehner, Sherrill Thrailkill, Velma Thrailkill, William Jewell College, World War II, World War II letters on July 16, 2016 by Deborah Sweeney. The last two days have been cloudy ones with occasional showers – good ones to be indoors catching up on letter-writing and packing. Yes, we’re packing and hoping to return home by the middle of October. All the officers here have enough points for discharge with the exception of Captain. The school is to be decommissioned in December so all of them should be civilians by the beginning of next year. Van, however, has applied for discharge since he’d like to enroll the first semester at college. How soon does Dr. expect to be discharged; he surely has accumulated enough points? [page 2] equipment makes it more enticing too. I’ll certainly be glad to bake again with an oven with a thermometer. John is surely active in school – there aren’t many musical functions in which he isn’t taking part, are there? It looks as if Mark might be following in his footsteps. Did David miss them when they started school? He has his little friends probably to keep him occupied though. Van and I went in to K.C. Saturday to see the football game between Kansas U. and Texas Christian. Kansas U. didn’t have much of a show – they didn’t even score so it was rather one-sided. The weather was much more suited to baseball. Most of the men were in shirt sleeves and the women who wore coats soon took them off. [page 3] I’m embroidering and making a crocheted border on each. Van says to say “hello” and would like to hear about Dr. so write when you can. 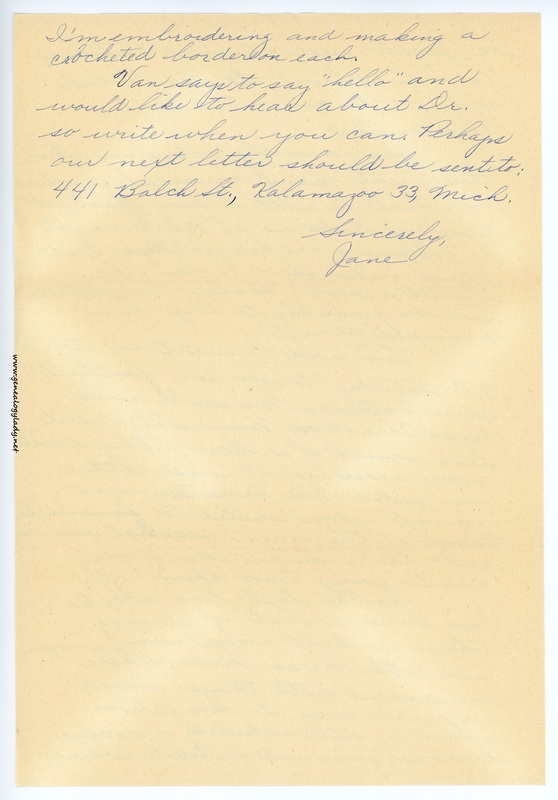 Perhaps our next letter should be sent to: 441 Balch St., Kalamazoo 33, Mich. 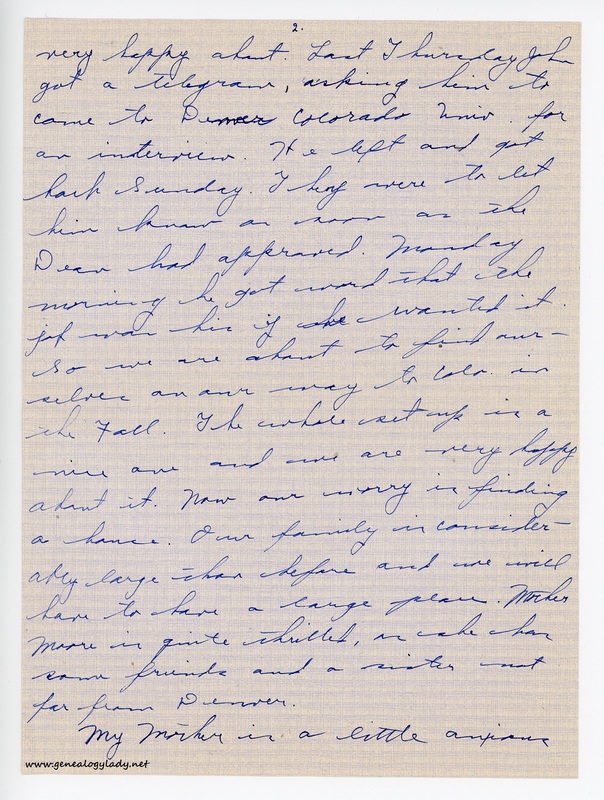 This entry was posted in Foster, Genealogy, World War II, World War II Letters, Yegerlehner and tagged David A. Yegerlehner, genealogy, Gladys R. (Foster) Yegerlehner, Jane Van Syoc, John F. Yegerlehner, Liberty, Mark A. Yegerlehner, Missouri, Naval Flight Preparatory School, Orrin J. 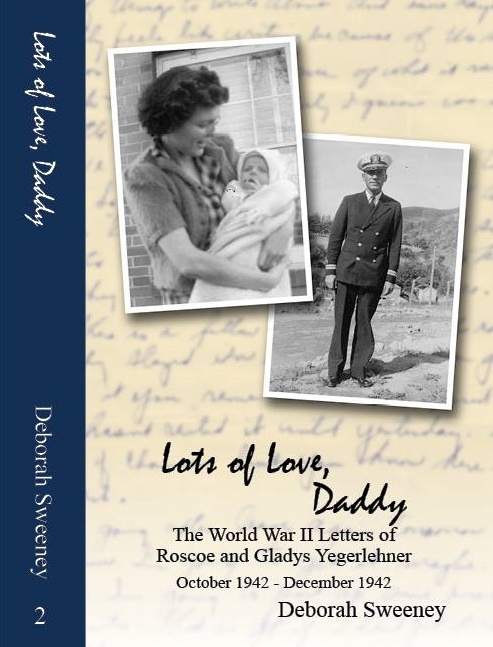 Van Syoc, Roscoe S. Yegerlehner, William Jewell College, World War II, World War II letters on June 8, 2016 by Deborah Sweeney. Would you be kind enough to write a note or a vaccination certificate for Madelyne and Francis Jr. as Madelyne is entering school Sept. 6th and it is imperative I have some notification that she has been vaccinated. 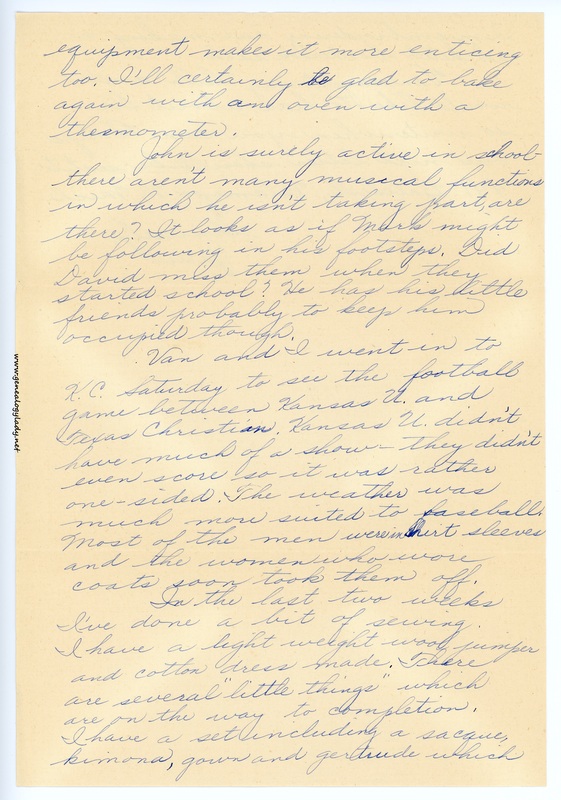 If possible would you make out separate notes. I hate to bother you for this. 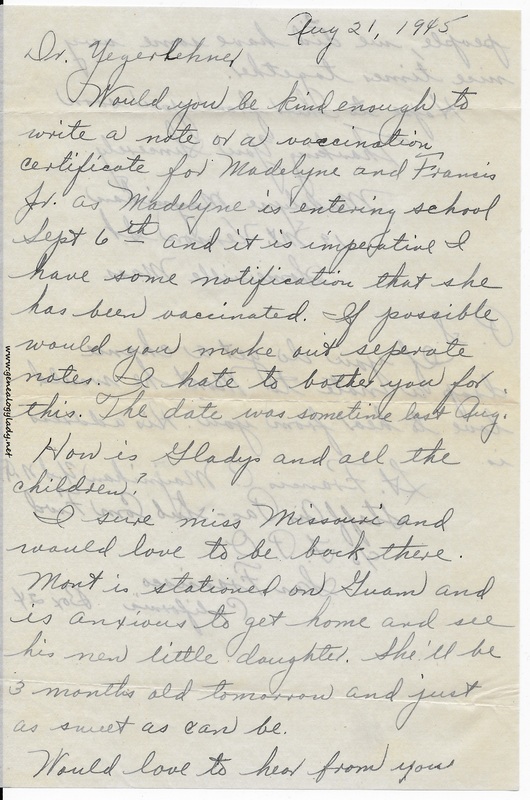 The date was sometime last Aug.
How is Gladys and all the children? I sure miss Missouri and would love to be back there. 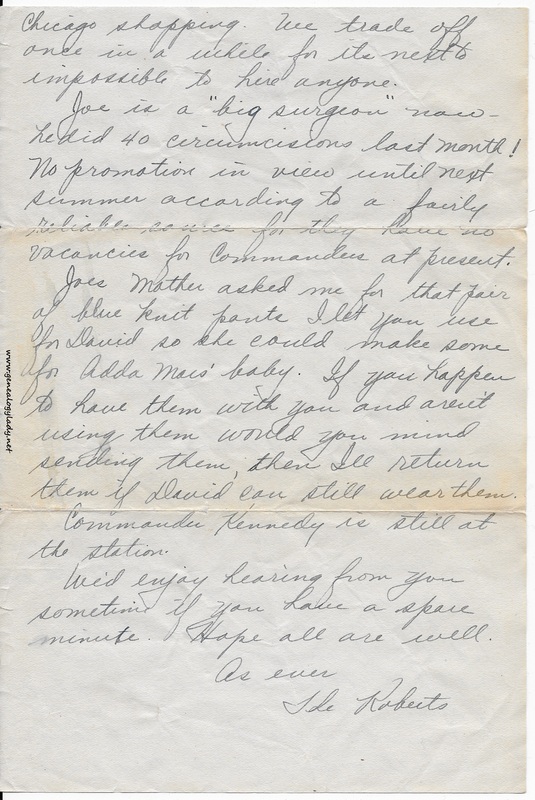 Mont is stationed on Guam and is anxious to get home and see his new little daughter. She’ll be 3 months old tomorrow and just as sweet as can be. [page 2] people, we did have some very nice times together. Lt. Francis C. Moynihan U.S.N.R. 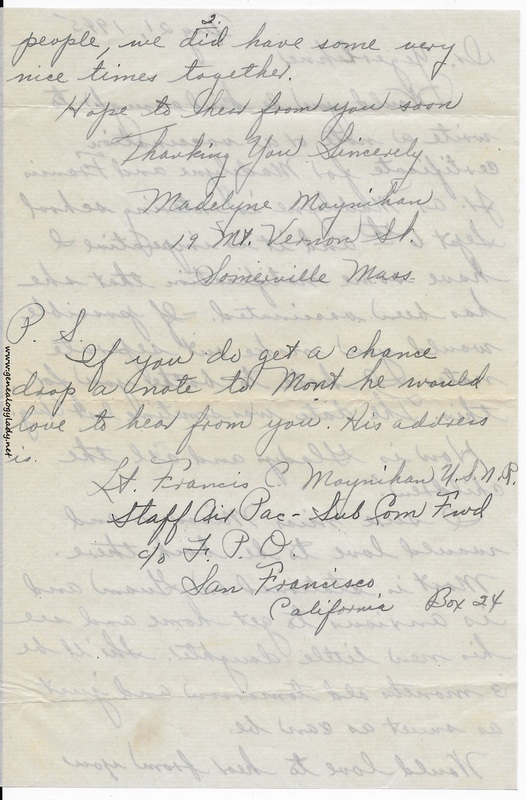 This entry was posted in Foster, Genealogy, World War II, World War II Letters, Yegerlehner and tagged Francis C. Moynihan, genealogy, Gladys R. (Foster) Yegerlehner, Indiana, Kentland, Liberty, Madelyne Moynihan, Massachusetts, Missouri, Roscoe S. Yegerlehner, Somerville, vaccination, World War II, World War II letters on April 9, 2016 by Deborah Sweeney. You and your family are invited to be the guest of the Navy faculty, officers, and ship company at a picnic held at Lake Mauer, Saturday afternoon, 4 August. Supper will be served at 1830 but many are going in time to have a swim before that time. Lieut. Roscoe S. Yegerlehner, medical officer at the V-5 Naval Academic Refresher Unit at William Jewell college the past 14 months, expects soon to be reassigned to the Pacific fleet and will leave next Wednesday for San Francisco, it was reported today by Lt. John B. Moore, commanding officer of the school. He will be replaced by Lt. Comdr. Claude B. Wright, who is scheduled to arrive in Liberty sometime this week from Jacksonville, Fla., where he has been in a naval hospital. Dr. Yegerlehner came to Liberty after twenty months with land-based hospitals in the South Pacific. During his service there he had charge of sanitation and helped establish new naval hospitals in New Caledonia and in the Solomon Islands and elsewhere in the Pacific area. He was also at the Great Lakes naval training center for a time. During his assigment here he has also had the supervision of the ‘sick bay’ at the Parkville college navy unit. 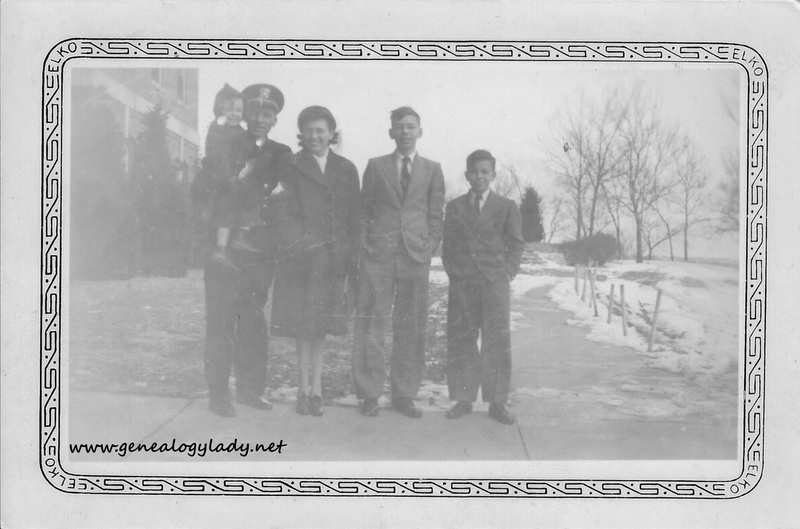 Mrs. Yegerlehner and two sons, Mark 12, and David 3, expect to go to the family home at Kentland, Ind. A third son, John, is a music student at Northwestern university. 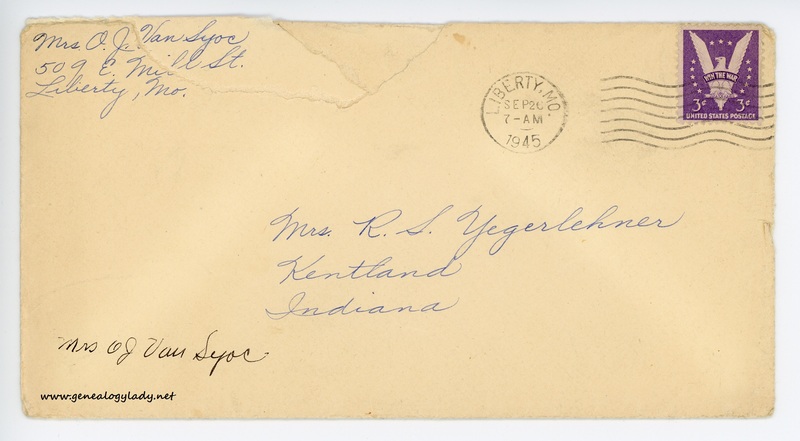 The Yegerlehners lived at 324 West Kansas street while in Liberty and during their residence made many friends. 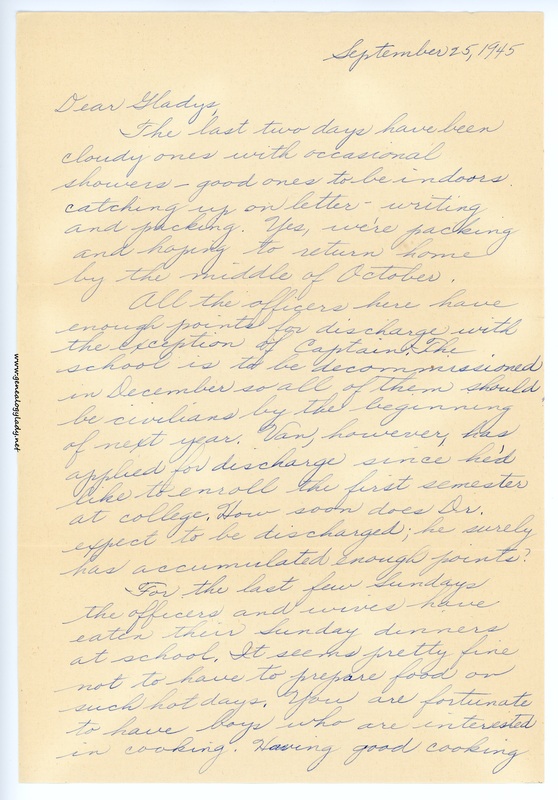 This entry was posted in Foster, Genealogy, World War II, World War II Letters, Yegerlehner and tagged David A. Yegerlehner, genealogy, Gladys R. (Foster) Yegerlehner, Indiana, John F. Yegerlehner, Kentland, Liberty, Mark A. Yegerlehner, Missouri, Northwestern University, Roscoe S. Yegerlehner, World War II, World War II letters on April 2, 2016 by Deborah Sweeney. 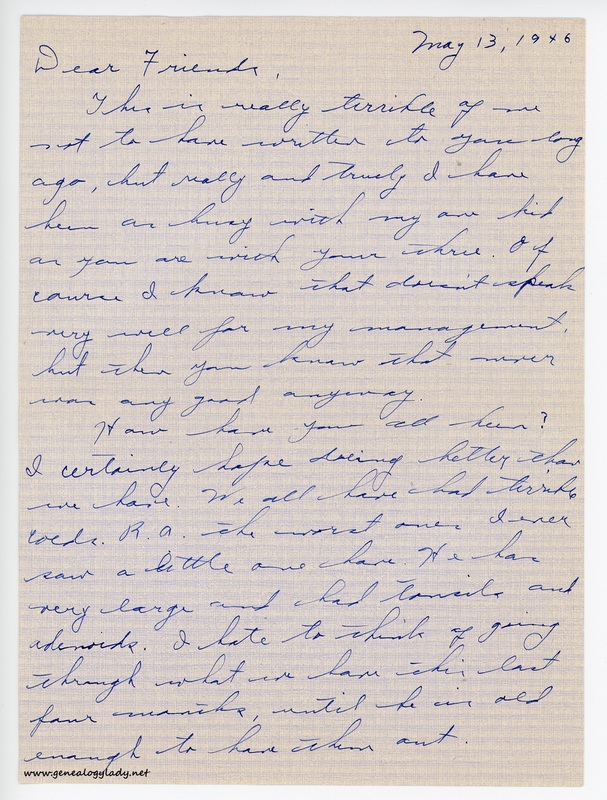 We speak of you folks often, but letter writing just seems to be one of those things we are forever putting off. We are still in the same spot and from most reports are fortunate to have what we do for there are so many who just can’t find anything. Our year is practically up and yours is up so I suppose we can both expect most anything but we’ll just sit tight and hope! We drove down home last week-end and as usual spent most of our time cleaning, but we at least didn’t find any moths on this visit, but there is always plenty of dirt. [page 2] Chicago shopping. We trade off once in a while for its next to impossible to hire anyone. Joe is a “big surgeon” now – he did 40 circumcisions last month! No promotion in view until next summer according to a fairly reliable source for they no vacancies for Commanders at present. Joe’s Mother asked me for that pair of blue knit pants I let you use for David so she could make some for Adda Mae’s baby. If you happen to have them with you and aren’t using them would you mind sending them, then I’ll return them if David can still wear them. Commander Kennedy is still at the station. We’d enjoy hearing from you sometime if you have a spare minute. Hope all are well. 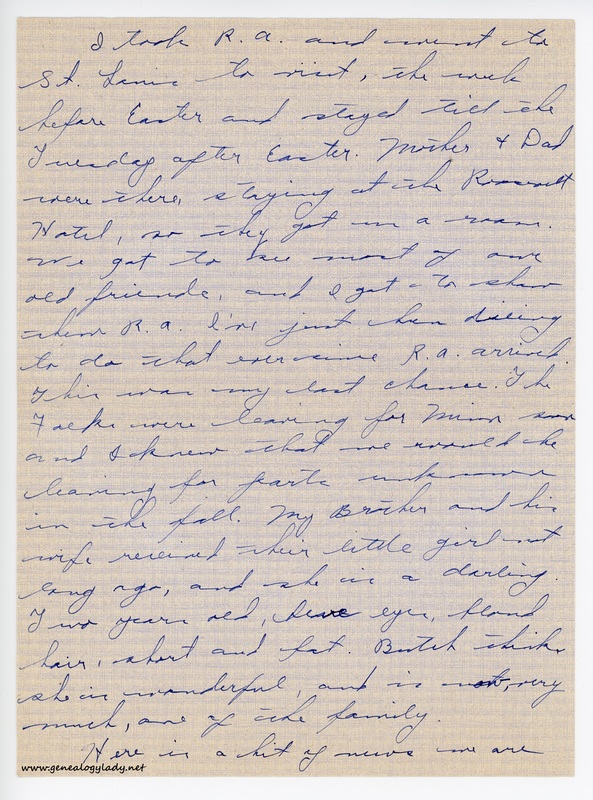 This entry was posted in Foster, Genealogy, World War II, World War II Letters, Yegerlehner and tagged Adda Mae (Roberts) Beebe, Commander Kennedy, David A. Yegerlehner, Dr. Joseph Roberts, genealogy, Gladys R. (Foster) Yegerlehner, Great Lakes Naval Hospital, Jennie M. (Leatherman) Roberts, Liberty, Missouri, Mrs. Leila Roberts, Roscoe S. Yegerlehner, World War II, World War II letters on March 27, 2016 by Deborah Sweeney. Sadly, the baby book has come to an end. Gladys was less diligent in the last few pages, combining multiple months onto one page. 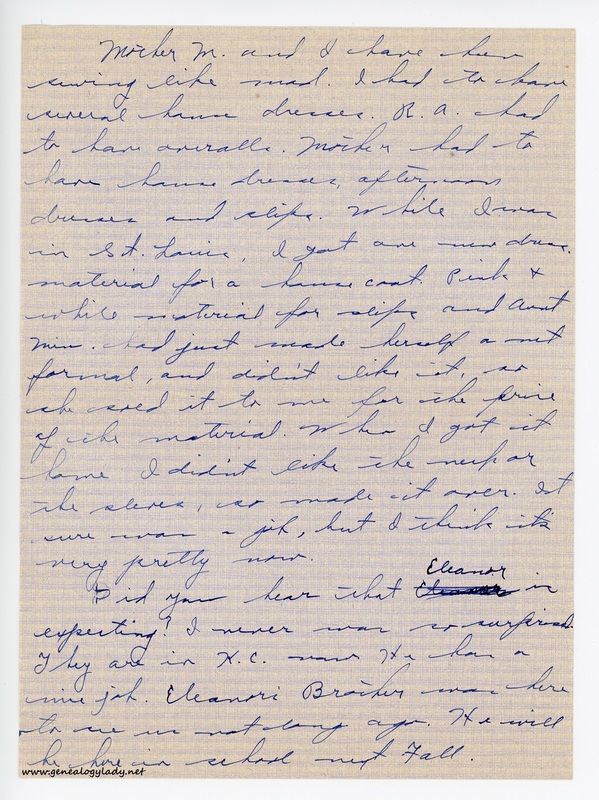 But it does give another glimpse into the family’s life in Liberty, Missouri. 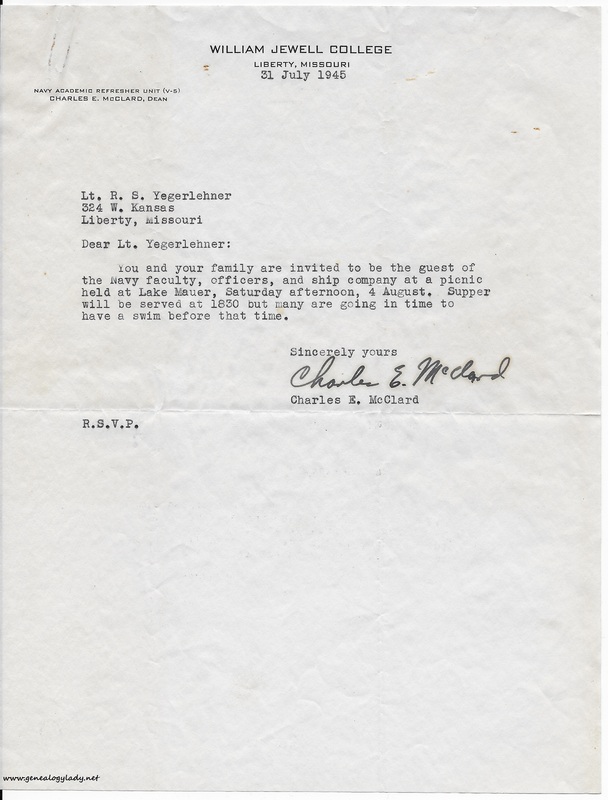 David’s third Christmas – we are living in Liberty, Mo. After calling on friends Christmas Eve, we came home and exchanged gifts. David was so excited and had as much fun opening his gifts as the rest of the family. He received a large Panda, Books, Wagons, blocks, puzzle, sand bucket & tools, suit and glow in the dark picture. 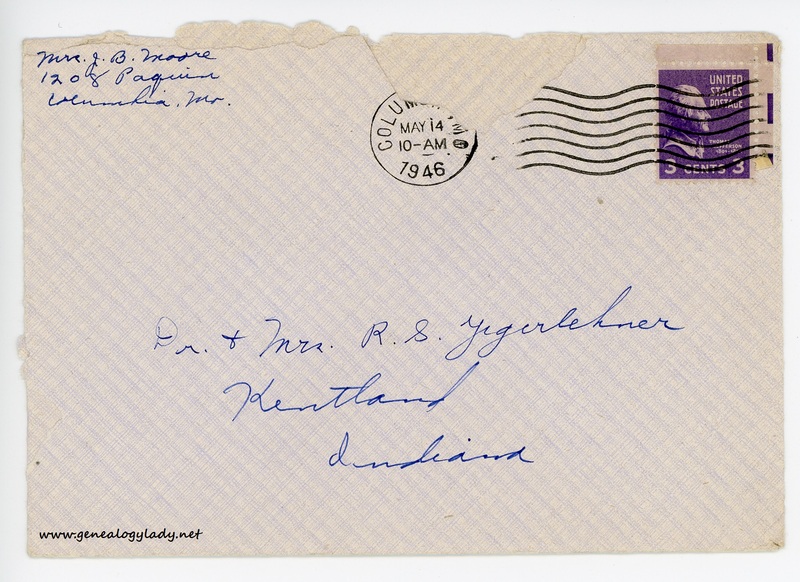 March 1945. 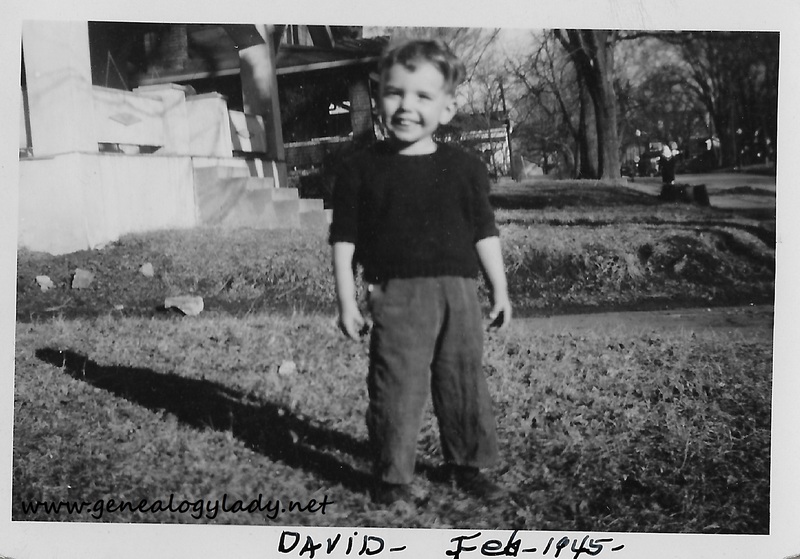 David is now 2 1/2 years old. Weighs 32 lbs. 36 1/2 tall. He is talking quite a lot. Can express himself very well. When we ask him a questions he replies, “Who me, talking to me?” or “not today.” He plays out in the yard and “makes” cottage cheese, meat, pie, birthday cake, etc., in his sand box. He says his soldier doll Bobby and Panda bite him. He likes to go to Sunday School. Sherril took him to a party given for children by the Girl Scouts on Easter Sat. 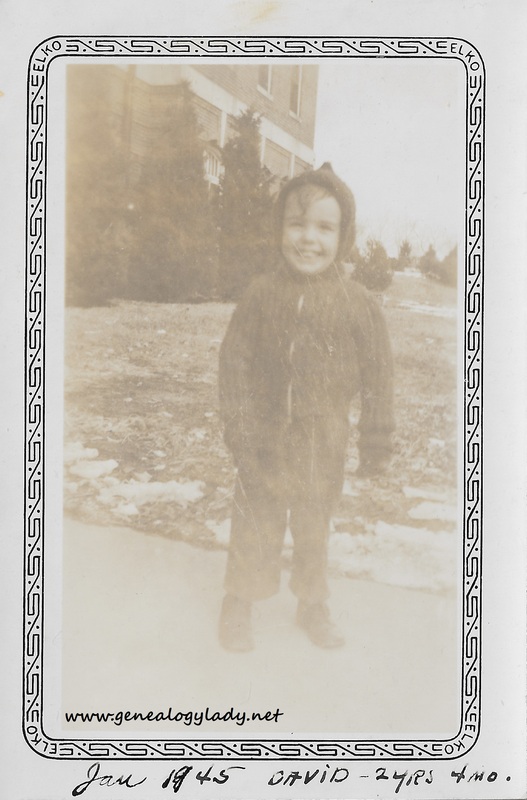 It was so warm today (3-31-45) he went out in the yard and undressed. He loves to take his clothes off. Can put his shoes and sox on but doesn’t lace his shoes correctly, can dress except for buttons. Usually gets his shirts on backwards. Apr. can now lace shoes. 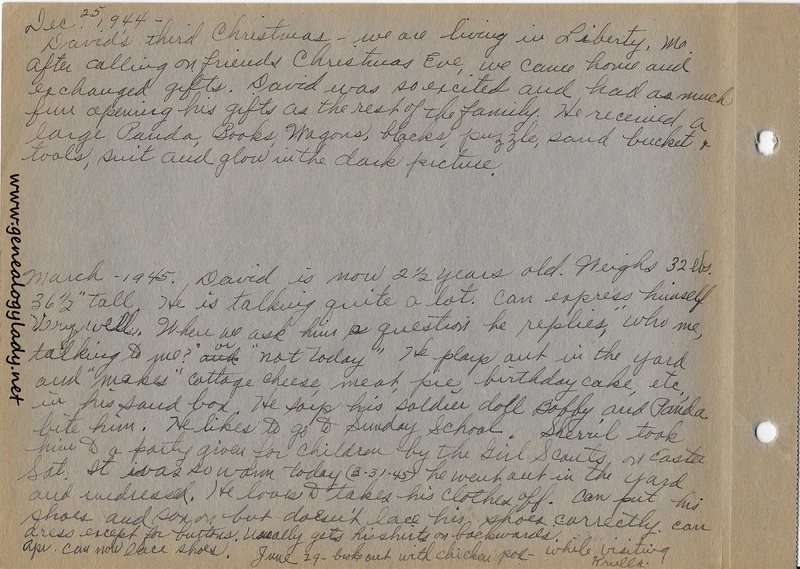 June 29 – broke out with chicken pox while visiting Krulls. 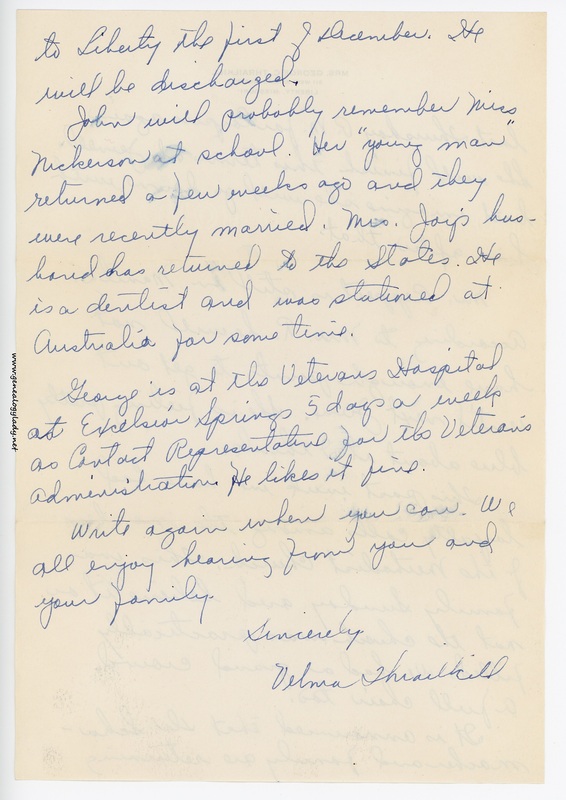 This entry was posted in Foster, Genealogy, World War II, World War II Letters, Yegerlehner and tagged David A. Yegerlehner, genealogy, Gladys R. (Foster) Yegerlehner, Krull, Liberty, Missouri, World War II on March 26, 2016 by Deborah Sweeney.